Everyone understands that cars, vans and motorbikes are 'vehicles', but did you know that the legal definition of a vehicle is anything with a motor? Therefore technically an electric scooter is a vehicle. Of course laws preventing the use of vehicles on public footpaths and in the countryside are designed to prevent physical damage to the area, and reduce noise pollution. There are therefore exemptions which mean that some "vehicles" such as electric powered bicycles or electric wheelchairs are allowed in "no vehicle" areas. Check local signs or contact the Land Owner for details before using a motor-powered "vehicle" if you are unsure. What legislation is in place to stop off-road vehicles using public footpaths and bridleways? The Countryside and Rights of Way Act 2000 - states that it is an offence to drive a 'mechanically powered vehicle' on a footpath, bridleway or restricted bridleway. Police Reform Act 2002 - Sections 59 and 60 of this Act give police the power to seize vehicles that are being driven in a way that causes, or is likely to cause alarm, distress or annoyance. The police must however first warn the driver to stop their actions and so are only able to seize the vehicle if the driver refuses, or resumes their anti-social conduct shortly after the warning is given. Road Traffic Act 1988 - It is an offence under Section 87 of this Act to drive a motor vehicle, that you do not hold a valid licence to drive, on a road (including a public right of way). It is also an offence to allow another person, who you know does not hold a valid licence, to drive a motor vehicle in your possession on a public road or right of way. In addition, Section 143 of the Act states that it is an offence to drive a motor vehicle without third party insurance on a public road or public right of way. Road Traffic Act 1991 - This Act extended the scope of offences such as dangerous driving and careless driving to include off-road areas to which the public have access. Therefore if any vehicle is driven dangerously or carelessly on a public footpath, the driver may be prosecuted for dangerous or careless driving. 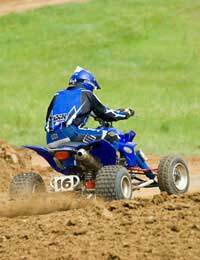 Environmental Protection Act 1990 - Section 79 of this Act is designed to prevent noise disturbance from off-road vehicles. Breach of this Act is punishable by a fine. Wildlife and Countryside Act 1981 Under this Act, it is an offence to without reasonable excuse, knowingly or recklessly destroy flora, fauna or geological interest features in a site of special scientific interest. This is of course the likely result of driving a motor vehicle off-road in such a special interest area. What attempts are being made to prevent off-road vehicles using public footpaths and bridleways? The National Trust have also erected hundreds of miles of physical barriers and gates to try to prevent off-road vehicles accessing footpaths. Local Councils and police are working with communities to try to prevent use of off-road vehicles in these areas. Police have increased foot patrols in "at risk" areas, and in some districts (such as West Yorkshire), initiatives involving undercover police patrols on unclaimed lost property bicycles have led to reduction in both the use of off-road bikes as well as other anti-social behaviour and drug related crime in countryside areas. If a public footpath is being used repeatedly for crime (for example by providing a commonly-used "get away" route for burglars on off-road vehicles), the police have powers to close and / or re-route public footpaths. I should point out for clarity, that pedal-assist mountain bikes (defined as having a max power of 250W and a max speed of 25km/h) are legally considered to be 'bicycles' for rights of way purposes. Twist-throttle e-bikes aren't, but a pedal-assist bike is. So you're allowed to ride a 'normal' e-bike on bridleways and byways. Perhaps you should clarify that motor vehicles are allowed on byways. The Mother of a Teenage Son next door admits she has no control over him so goes away every weekend and leaves the semi-detached house to him and his friends who drink; take drugs;play loud music and smash bottles in the garden until all hours.I have spoken to him and her separately both calmly and in temper, but nothing I say has an effect.She says to phone the police but we do not want to have to declare a neighbour dispute if ever we sell the house.Feel so angry the little s**t is getting away with it scott-free.